Reproductive effort was compared among California gulls ranging in age from 3 to 18 years old. Results indicated that reproductive effort increased with parental age. 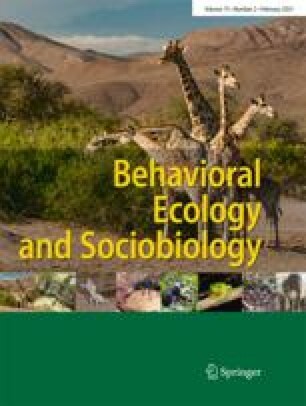 Older parents (11–18 years old) invested more in foraging effort and in defense of offspring than did younger parents (<10 years old), and did so over a greater period of time. Increases with age in the efficiency of parenting could not be demonstrated. Increased levels of reproductive effort, therefore, appeared to be the main factor responsible for age-related increases in breeding success. The higher levels of reproductive effort of old parents were associated with higher mortality. Thus, data support the prediction that a cost-benefit system of risk of mortality vs reproductive gain operates in this population. Higher levels of reproductive effort can increase an individual's reproductive success; however, it also increases the likelihood that it will die. Therefore, for the young parent, high risks of mortality involved in current production would be too costly (in terms of loss of future reproductive success) to justify the benefit of high current reproductive output. Parents achieve the highest likelihood of maximizing life-time reproductive output by increasing reproductive effort with age as the cost of mortality diminishes. Data testing the relationship between parental age and reproductive effort demonstrate the existence of age-related variation in reproductive investment. They also demonstrate that the concept of reproductive value proposed by Fisher (1930) has validity as a framework which supports much of our theory on life history evolution.